To avoid memory fragmentation, MaxxECU needs to "reorganize" the internal memory automatically in the background, and sometimes (very rare and unlikely) there can be an issue which manually needs to be fixed. 1. 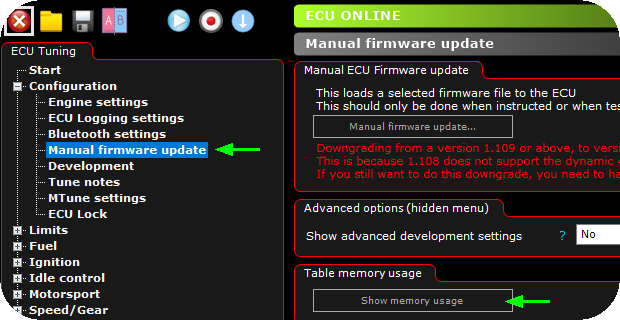 Go online, head over to Configuration --> Manual Firmware update, table memory usage and click the show memory usage button. 2. A visualization of the actual memory location is presented, press the reorganize memory button, wait a few seconds and restart the ECU. Note: Make sure to check all settings, if you can, load the default tune found in MTune folder, then load your last saved tune by using the open dialog and write option.